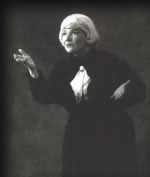 Mother Jones was a union organizer and labor activist in the early part of the twentieth century. An Irish immigrant to America, Mary Harris Jones experienced a life of hardship. She lost her family to an epidemic and her home to the Great Chicago fire. She devoted the remainder of her life to bringing decent working and living conditions to people of all walks of life. An outspoken and fiery activist, she was instrumental in organizing the textile mills, railroad workers, steel workers, factory workers and, of course, coal miners. Karen Vuranch recreates Jones' fire and energy. Placing her audience in the role of workers, she cajoles and exhorts them to work together for the cause of their union. Her lively presentation leaves you knowing how it felt to sit in a union hall and listen to the outspoken Mother Jones.